Manager Bob Peeters believes Charlton owner Roland Duchatelet will invest in new signings in January if the club are still challenging for promotion. Charlton are outside the Championship play-off places on goal difference. 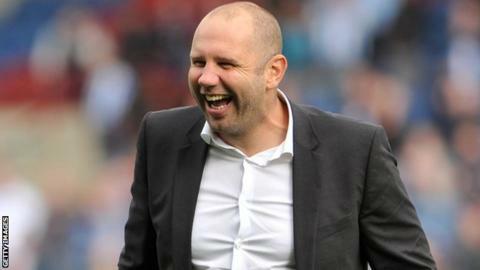 "He's backing us already - we've brought some good players in," Peeters told BBC Radio Kent. "But if we're in this situation around the new year I think one or two quality players will come in. He knows what we want and hopefully he can provide it." Charlton were unbeaten in the league under the Belgian before a 1-0 loss against Bournemouth on 18 October. They bounced back by beating Bolton 2-1 at The Valley on Tuesday - 24 hours after Peeters had met with Duchatelet to discuss their future plans. Peeters explained: "We had dinner on Monday evening and he was at the game on Tuesday, so we had a good conversation about everything concerning Charlton. "We only have 18 or 19 players. That's what we discussed. We agreed that we don't want too big a squad. "We want a group of 20 good-quality players, but it's important that if we bring in players they must have an amount of quality."